The Bible begins and ends with God dwelling with his people, from Adam and Eve in the garden of Eden, to the great multitude in the New Jerusalem in the book of Revelation. At each step, God gathered his people together, to speak to them, hear from them, and change them to be more like him. God assembling his people, whom he loves, is what the Bible calls 'church'. The church should aspire to be a group of vibrant, loving, risk-everything people who are passionately committed to living out the values of God's Word and looking forward to the new creation. Churches and their pastors and leaders need to hear what the Bible says about who they are and what they are to do. 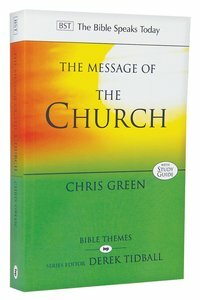 Chris Green takes 'the message of the church' to mean, first, that the church has a message, which is that God has saved his people through Christ; second, that the church is the created and saved result of that message; and third, that the church is a message, which is that he has saved broken people like us, and by belonging to his people we are trying to respond to him in the ways he requires. His stimulating and insightful exposition begins with a survey of the church 'from eternity, to Eden, to exodus, to exile, to eternity', and then focuses on various dimensions of the church's life and ministry, including its worship, unity, maturity, servants, gifts, holiness, boundaries and future. About "Message of the Church, The: Assemble the People Before Me (Bible Speaks Today Themes Series)"
Chris Green was born and raised in Kentucky and now teaches at Marshall University in Huntington, West Virginia. He is active in the Appalachian Studies Association, and works for recognition of Appalachian literature. He is the author of RUSHLIGHT: POEMS (Bottom Dog Press, 2009) and The Social Life of Poetry: Appalachia, Race, and Radical Modernism (Palgrave Macmillan, 2009).